College Covers Brand Bed in a Bag includes a reversible comforter, logo patterned sheet set, printed bed skirt and sham (s). All items are 100% cotton sateen 200 thread count for a softer feel than any other collegiate bedding available. 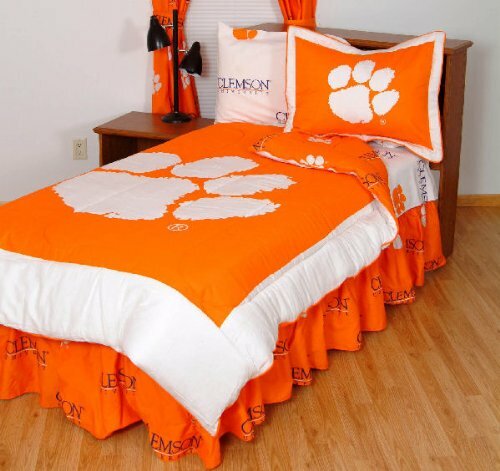 Comforter has the University logo printed large on front with an all over logo pattern printed on the back giving you a truly reversible comforter with two unique looks. Sheets, pillowcase(s) and bed skirt are printed with the same all over pattern as back of comforter. Twin size sets come with one sham, full, queen and king size sets come with two shams. All College Covers items ship within 2-3 business days from receipt of order. Please look further for all College Covers matching home accessories.